Within today's bounds of Rotfelden there used to be two parish farmsteads and two free farmsteads originating from two different residences of nobles. A tithing and hunting right boundary separated the two areas, leading through the middle of today's district. Both of them, however, had been a feoff of the Bishops of Bamberg since the year 1007.The social structure of the two parish farms are the origin of the hereditary family name of Beutler. The northern parish farmstead. It belonged to the northern parish church of Rotfelden and was in religious matters subordinate to the Monastery of Hohentwiel or Stein/Rhein respectively. It remained in charge for about 500 years. Parish farm, parish house, parish church and cemetery were situated 1.7 m north of today's village centre close to the Alte Weinstraße on the Wendener Kirchweg or Totenweg. The inhabitants of Wenden belonged t this church "dead or alive". But starting in the 14th century economical difficulties started.. The takings dropped dramatically, accompanied by an enormous reduction of inhabitants. The Monastery of Stein/Rhein was no longer capable of maintaining the parish in the traditional way. In 1399 it was incorporated to remedy the deplorable state of affairs, unsuccessfully though. The parish priest moved to the village, the parish church decayed; in 1470 it was last documented. The parish farmstead, which was also moved to the village, lost its privileges. Shortly after the reformation the last tithing area of Rotfelden that still belonged to the Monastery of Stein/Rhein, was sold to Württemberg in 1543. The southern parish farmstead was called free sovereign and parish farmstead. It was the core of the local nobles of Rotfelden immediately west of today's village centre situated in the vicinity a water-surrounded castle and a fish pond. Contrary to the northern parish farmstead it also possessed lordly prerogatives, such as the high permission to hunt deer and to fish. These rights were passed on through Nagold to the Bishops of Bamberg and later to the Counts of Hohenberg and their liegemen. After the decline of the Counts of Hohenberg the local nobility of Rotfelden also declined, they castle decayed. Their descendants gradually became peasants. The prerogatives connected to Nagold were reclaimed by Württemberg when the Nagold Forest was established. From the tremendous changes in the 14th and 15th century the present village of Rotfelden with its district emerged. The so-called first donation of the monastery. Duke Burkhard II of Swabia (died 973) and his wife Hadwig (died 944) donate a Benedictine Monastery on the Hohentwiel Mountain in honour of the Virgin Mary, Saint George and Saint Cyrill. The first Lord Abbot was said to have been Walafrid or Wolfried the Beatified, Count of Calw and Nagold. The so-called second donation of the monastery. King Henry II moved the monastery donated by Burkhard and Hadwig to Stein/Rhein and transferred to it – upon request of the Abbot of Reichenau, the Duke of Swabia and other Swabian nobles – possessions in 14 villages that the King had inherited from Hadwig, including Nagold, Epfendorf, Fischingen, Oberiflingen, Effringen, Rotfelden (Rathfelda), Sindelstetten (abandoned Bei Altensteig) with their parish churches, tithings, farmsteads and persons liable to pay tribute, bondmen and bondwomen, meadows, fields and forests, built-up and not built-up, immovable and moveable, with servants, families and appurtenance. The King declares to subordinate the monastery to the Diocese of Bamberg, which was still to be founded, prohibiting, however, any taxes and dues of the Bishops and other sovereigns. King Heinrich II subordinates the Monastery of Stein/Rhein to the Diocese of Bamberg founded by him. He gives to this Diocese on the same day possessions in 28 villages including Nagold and the Nagold District, with everything belonging to them such as villages, churches, bondmen and bondwomen, buildings, woods, forests, meadows hunting grounds, waters, fishing waters, mills, built-up and not built-up and other appurtenance. The contents of both documents of 1005 and 1007 complement each other. The formulations are the reason for the fact that the Monastery of Stein at Rotfelden was not endowed with lordly prerogatives, such as free sovereign farms, forests, the permission to hunt deer and to fish as well as mills. Erlewin von Rotfelden, witness for the Monastery of Hirsau. He is most probably identical with Erlewin von Bernbeck and a close relative of Erlewin von Steinheim. He belongs to the class of free noblemen and is therefore not subordinate to the Monastery of Stein. Konrad von Beutelsbach and his brother Bruno, Abbot of the Monastery of Hirsau, bequeath to this monastery a large estate (curia) at Pfrondorf. The estate is situated in the middle of the Nagold Forest donated to the Diocese of Bamberg in 1007. The clergyman Heinrich von Mühlen near Horb bequeaths to the Monastery of Reichenbach in the valley of the River Murg an estate (predium) at Rotfelden. This estate did not belong to the Monastery of Stein. It was situated in the now built-up area of Rotfelden. Heinrich von Mühlen is probably an early relative of the Heinrich called Zebanach mentioned in 1294. Abbot Heinrich von Stein/Rhein enfeoffs Volmar, the sin of the Mayor (causidicus) of Horb with the Ungerichtshof farmstead at Oberiflingen. Rotfelden parish church mentioned in the so-called Liber decimationis. This church was situated 1.7 km north west of today's village church and belonged to the Stein Monastery since 966/1005. Berthold Ungericht of Sulz/Neckar gives his tithe rights at Rexingen near Horb invested to him by the Monastery of Stein/Rhein to the local Knights of St. John. One of the witnesses is Conrad Böcklin, Mayor of Horb and his brother Dietrich. Burkhard, church superintendent at Rotfelden, must sell his estate at Pfrondorf (curiam nostram in Phlundorf) to the Hirsau Monastery because of great debts. Burkhard is a close relative of the brothers Conrad and Dietrich Böcklin. Berthold Ungericht of Sulz/Neckar sells together with his wife Irmingard and the children Heinrich, Berthold and Adelheid the tithe rights at Rexingen near Horb belonging since to the Monastery of Stein. Since Berthold has no seal of his own, Konrad von Neneck and his brother Heinrich, Mayor of Sulz, use their seal. Both brothers are sons of Volmar, who was invested with the Ungerichtshof farmstead at Oberiflingen in 1245. Reinhard and Wetzel von Rotfelden are witnesses of the selling of Oberjettingen. Reinhard is probably the father of Wetzel and of Heilwig von Rotfelden, mentioned in 1294. The Monastery of Stein/Rhein sells the so-called Ungericht tithe at Rexingen to the local Commandery of the Order of St. John. Among the witnesses is Knight Volmar von Neuneck – he was invested with the Ungerichtshof farmstead at Oberiflingen – and his grandson Ulrich, church master at Nagold. Heilwig von Rotfelden and her husband Heinrich called Zebanach (Hainrich dicti Zebanach de Ratvelt) and their sons Heinrich, Johann and Konrad sell properties at Haiterbach inherited from Heilwigs mother, with the consent of Count Burkhard von Hohenberg. Two documents exist, one is sealed by Count Burkhard, the other one by the Dean of Öschelbronn, since Heinrich called Zebanach had no seal of his own. Wetzel von Ebhausen, donates the St. Nicholas altar piece in the filial chapel of Nagold with the annual receipts from his estates at Ebhausen and Rohrdorf. He determines that after his death of his heirs should present on the altar with the consent of the Abbot of Stein and the Nagold church master. If there is no heir the patronage passes to the Abbot of Stein. Attached to the document are the seals of the Bishop of Constance, the Abbot of Stein, the church superintendent of Nagold Walter and of Wetzel of Ebhausen (Weccelonis de Ebhusen). The hatchet in his coat of arms was included by the community of Ebhausen into its own coat of arms. Wetzel of Rotfelden and Wetzel of Ebhausen were presumably one person, Heilwig and Wetzel brother and sister. They have probably determined today's boundary between Rotfelden and Ebhausen by partition of the inheritance. The parish farmstead Rotfelden mentioned when Duke Burkhard von Hohenberg pawned the village of Rotfelden to his son. Monastery Stein/Rhein sells the free farm, the tithe and the advowson right of the Effringen parish church to Konrad Grückler. Hans Schäffer, citizen of Wildberg, sells his farms and estates at Rotfelden to the church of Ebhausen. Hans Schäfer could be the great-grandson of Heilwig von Rotfelden and Heinrich called Zebanach. His brother Konrad is Mayor at Wildberg in 1387. 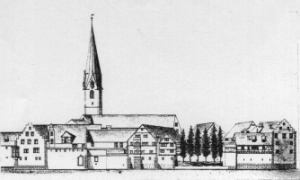 Pope Bonifaz IX incorporates the parish church at Rotfelden into the Monastery of Stein/Rhein, since the abbot and convent of the monastery declare that they can no longer support the church from its income. The parish farmsteads Rotfelden mentioned as neighbours in the description of the Spitzin estate of Rotfelden. Mentioned also are Alber Ungericht and Henibein, both probably great-grandchildren of Heilwig von Rotfelden and Heinrich called Zebanach. Young nobleman Ulrich von der Hohenklingen as well as other nobles and mayors decide an argument between the Monastery of Stein/Rhein and Burkhard Meier from Oberkirch near Nagold about the free farmstead at Oberkirch, the tithe at Mindersbach and the parish field. Burkhard Meier returns all feudal tenures he and his deceased brother Lupolt had received from the Monastery of Stein/Rhein. Parish priest Aubrecht Küng of Rotfelden, Mayor Conrad Alber, Wernher Ungericht and the others (which refers to the other judges of the open court at Rotfelden) document that they sold to the Monastery of Reutin near Wildberg a ground rent of 18 h for 36 h, which St. Georg is entitled to receive for the Langnau meadow. St. Georg means today's parish church, then a chapel which was directly attached to the farm of Wernher Ungericht. Its priest is Siegler. The two citizens of Dornstetten, Henslin Schenner and Aberlin Lettschmann sell to St. Georg at Rotfelden a levy from farms and estates at Wenden built by Syverlin. St. Georg means today's parish church, then a chapel which belonged to the farm of Wernher Ungericht. Wernher Ungericht was the owner of the free sovereign and parish farmstead at the southern boundary. The privileges that had always existed in this area (such as the bird hunt, the deer hunt, fishing rights, etc.) were claimed by the territory sovereigns of Baden and Württemberg since 1432. Hans Böcklin from the Euting valley sells 2/3 of the parish mill of Rotfelden plus the respective tithe to his cousin Wilhelm Böcklin. The widow of Wilhelm Böcklin sells her share to the Count Eberhard von Württemberg in 1468. This mill is not today's mill, which was constructed not before 1764, but the northern Öden mill. Because of the donations in 1005 and 1007 it did not belong to the Monastery of Stein/Rhein. It disappeared in the 15th century. Date Rome, apud Sanctum Petrum. Pope Paulus II affords protection to the abbot and convent of the benetictine Monastery of St. Georgen at Stein. He confirms the possessions of the Monastery including all estates, spiritual and physical liberties, tithes, rents and levies as well as the incorporated parish church f Rotfelden (Raczfelden). In this document the Rotfelden parish church belonging to the Monastery of Stein is mentioned for the last time. It was situated 1.7 km north west of the present centre of the village. Wernher Wydmayer, owner of the parish farmstead of Rotfelden. The farm was also called Martelens Gut and at the original location (diagram, 109 KByte) there is still today the field name "Bäcker Martins Wäldle" (Martin the baker's little forest). The tradition of bakers in the family of Peter Beutler and his descendants might originate from this Baker Martin. The Monastery of Stein/Rhein sells to the former Mayor of Besenfeld a mortgage from the tithe at Nagold, Mindersbach, Emmingen, Iselshausen and Unterschwandorf. Peter Stoll, called Langpeter of Rotfelden sells to the priest of Rotfelden and the trustees of the saints "Reverends heavenly nobles, knights and martyrs St. Jörgen of the parish church of Rotfelden" a mortgage from the Erlach meadow at the Bettenberg. Peter Stoll is a cousin of Wernher Wydmayer and nephew of Wernher Ungericht. In this document, sealed by Mayor Berthold Bock, today's village church is mentioned for the first time. 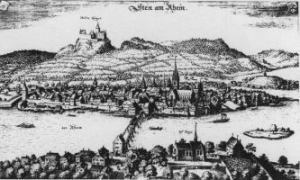 Michael Schütz from the Euting valley – before the year 1474 citizen of Horb – sells to Count Eberhard von Württemberg 1/3 of the mill and the respective tithe at Rotfelden. The other 2/3 were sold before by Böcklin in 1466 and 1468. This is the last time that the so-called Öden mill is mentioned. The former location is wooded today but can still be recognised well. The Öden or Euten (se Euting valley) were the owners of the mill. First exact description of estates and farm of the southern parish farmstead of Rotfelden, the free sovereign and parish farmstead "as it used to be called from old times". The total size was 63 hectares which remained undivided until the 18th century. First exact description of estates and farm of the northern parish farmstead, owner Peter Wydenmeyer, former mayor and his brother Conrat Wydenmeyer, sons of Wernher Wydenmeyer. The city of Zurich as custodian and protector of the Monastery of Stein/Rhein sells the tithe at Rotfelden and Wenden including the patronage over the parish benefices to Duke Eberhard von Württemberg. The citizens of Altensteig Johann Weinmar with his wife Magdalena and Jakob Baur with his wife Agatha sell to Duke Eberhard von Württemberg for 95 guilders an annual product mortgage from Bartlin Beutler's feudal tenure at Rotfelden. So the Rotfelden parish farmstead and the church belonged to a Benedictine Monastery which was founded around 966 on the Hohentwiel mountain and moved to Stein/Rhein by Emperor Heinrich II in 1005. In summer 1525 the reformation was introduced coming from Zurich and the last abbot flew to Radolfszell. 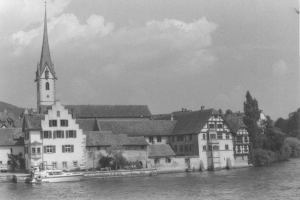 The city of Zurich finally sold the possessions and rights on the former monastery in 1543 to the Duchy of Württemberg. Many of the former monastery constructions can still be seen at Stein (see photo and for comparison the two pictures dating back to the 17th and 18th century). The last abbots resided in the two buildings with half-hip roofs (on the photo on the right side). There probably the delegations from the Rotfelden parish farmstead were received.